When you get paid with a check, there are two ways to get access to the money behind the check: You can either cash the check or deposit it. In the process of negotiating that check, you’ll want to keep fees to a minimum and avoid expensive mistakes. The simplest way to cash a check is to go to a bank or credit union where you have an account. If you don’t have a bank account, there are several alternatives described below. Ask about any fees for cashing the check and less expensive options for getting your money. Endorse the back of the check by signing your name in the endorsement area. Fill out a deposit slip (if necessary) and sign the slip. Show valid identification to the teller. Get your cash and put it in a safe place before leaving the building. The best places to cash a check are your bank, or the bank the check is drawn on (that’s the bank listed on the face of the check— where the money will come from). Your bank probably won’t charge any fees, but you may have to pay if you go to the check writer's bank. Full amount? 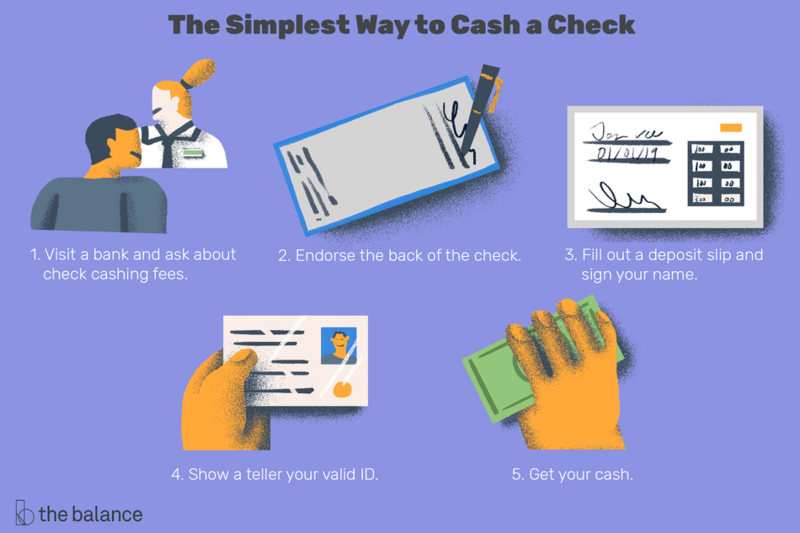 The advantage of going to the check writer's bank is that you've got a better chance of getting 100 percent of the check amount immediately — that bank has real-time access to the checking account in question, so the funds can move instantly. Your bank’s policies: Your bank might only allow you to take $200 in cash, and you'll have to wait a few days before the rest of the money becomes available. It’s certainly possible that your bank will let you take more cash immediately (or spend the money using your debit card). But until the check actually clears, there’s a risk that the check will bounce and you’ll have to replace that money. Any bank can refuse to cash a check — even if their customer wrote the check and has sufficient funds. The bank may decide not to cash checks if something is suspicious, or if they simply don’t want to serve non-customers. Other locations: Check cashing stores, cash advance, and payday loan shops will also cash checks for you. However, they typically charge high fees, so it’s best to avoid those places. Over time, the fees add up. You can probably do better (or avoid fees altogether) by opening an account at a bank or credit union. If you'll receive more than a few checks each year, open a bank account. In addition to saving money on fees, you’ll most likely save a lot of time if you have a bank account. Grocery stores and supermarkets are typically less expensive than check cashing stores. Prices might range from one to three dollars (or less). Ask about services at the customer service desk in the front of the store. If opening a bank account simply isn't an option for you, consider using a prepaid card account instead. Some prepaid cards allow you to deposit checks with your mobile phone (so you don’t have to make a trip to the check cashing store or bank branch). You can then use the card to withdraw cash or make purchases (although you might have to wait for the check to clear before you can spend all of the money). Take the time to learn about all of the branches available to you, including ATMs that accept deposits. Credit union members may have additional options: If your credit union is part of a shared branching network, you can use thousands of branches nationwide to cash checks. You might not need to cash a check. You can always deposit the money without taking cash. The bank will add the funds to your account and you can use the money later. Only get cash if you plan to spend the money soon. The money is safer in the bank, and you won't be tempted to spend more than you need to. It might even be more convenient to deposit the check. You can do this from just about anywhere with a mobile device, or you might swing by an ATM to make the deposit after your bank has closed. Before you try to get cash, make sure the check is legitimate. If you try to cash a check that is not legitimate, you can get into legal trouble, get ripped off, or end up owing fees to the bank. Some common scams involve paying you with a fake check, and then asking you to do something (like wire money out or give cash back to the check writer) before the check bounces. Other problem areas involve cashing a check for somebody else or signing a check over to somebody so they can cash it for you. When in doubt, call the bank that issued a check to verify funds in the account before you try to cash it. If you're not sure if a check is legitimate, either take it directly to the check writer's bank or deposit the check and wait a few weeks for it to clear before you spend the money.